Today, no one needs to get away to get divorced; they just divorce. But “splitting blankets” was not always easy. The creation of the “quickie” divorce. In 1931, in the depth of the Great Depression, the Nevada legislature passed two bills: one for the legalization of gambling; the other for the six-week divorce. Both laws set Nevada apart from the rest of the Nation — morally and legally — and would color the popular image of the State for decades to come. In most states at the time, divorce required a wait of a year or more and sometimes required proof of adultery. In 1931, Nevada made it simple: six weeks’ residency anywhere in the state (reduced from three months residency); a short list of nine legal grounds that required little or no proof (the most popular was mental cruelty); and an average of six minutes in court before the judge to get the divorce decree. Hotels, boardinghouses and dude ranches sprang up to accommodate the influx of six-week residents. Divorce seekers spent money on food, lodging, gambling, drinking, lawyers, Western wear and more. Some divorce seekers fell in love during their six weeks — some with the wide open spaces of the State, others with a local lady or gent they met. Many wealthy Easterners settled in Nevada after their divorce, bringing their wealth and culture with them. Nevada’s migratory divorce business helped Nevada get through the Depression years. Las Vegas gets in the act. In 1939, Ria Langham Gable went to Las Vegas to divorce her movie star husband, Clark Gable. Boulderado Ranch brochure cover, 1941. At the time, Las Vegas was in need of a publicity angle to attract visitors and business. In 1936, the Hoover Dam workers had left the area and legalized gambling had not yet taken hold in the small town. When Ria Langham Gable showed up in Las Vegas to get a divorce, her lawyer leaked the word to the Las Vegas Chamber of Commerce and a plan was conceived. John Cahlan, the editor of the Las Vegas Review-Journal, Florence Lee Jones, a reporter, and the Las Vegas Chamber of Commerce agreed to keep the Gable vs. Gable story out of the papers for six weeks. In exchange, Ria agreed to pose for photos that could be used for publicity after her divorce. Ria was photographed boating and fishing on Lake Mead, and dealing craps and blackjack at the casinos. She enjoyed the attention and the press quoted her as saying her six weeks had been “the finest and shortest vacation I ever had in my life”. When Ria’s divorce was final, the Review-Journal released the big story to newspapers nationwide and Las Vegas got the publicity boost it was seeking. By the end of 1939, a record number of Las Vegas divorces were granted (738). Everyone, it seemed, wanted to get a divorce where the Gables had gotten theirs. Throughout the 1940s, Reno continued to retain its title as “Divorce Capital of the World”. However, in the 1950s, Las Vegas began to catch up, and by the 1960s, was granting half of Nevada’s divorces. Preserving Nevada’s remarkable divorce history. Today, the need to go to Nevada to get a divorce is no longer necessary. However, the remarkable story of Nevada’s divorce business and how it changed divorce in America is a part of history few know about today. Authors Bill and Sandra McGee are passionate about preserving Nevada’s divorce history. From 1947-1950, Bill , a Montana cowboy, worked as the head dude wrangler on the Flying M E, an exclusive divorce ranch 20 miles south of Reno. 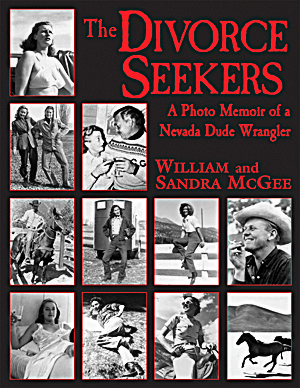 In 2004, Bill and Sandra co-authored The Divorce Seekers: A Photo Memoir of a Nevada Dude Wrangler. The coffee table book is a collection of Bill’s personal stories — laced with names like Gable, Gardner, du Pont and Astor – mixed with sidebars about Nevada’s migratory divorce business and other pertinent history. The book has 500 photographs (most from private collections) providing the reader with an up-close glimpse into life on a Nevada divorce ranch. “The Divorce Seekers is the best and most complete book yet on Nevada’s famous divorce ranch business”. In another effort to preserve Nevada’s divorce history, Bill and Sandra McGee are currently consultants on RENO and The Romance of Divorce, an upcoming documentary that tells the remarkable true story of how Nevada redefined divorce in America. To view the documentary trailer, see the Category, “Documentary Shorts & Interviews about the Reno Divorce Era”. In the movie, “the Women”, I never understand why all the women were staying at the ranch while getting a divorce until I read this blog. Thank you for explaining the 6-week residency rule!